Skip to Overview and beyond if you just want to learn the build. It is generally accepted among high level Starcraft 2 players that the best way to improve is to use the same build every game. The idea of this is the same as when people tell random players that they will improve most quickly by using the same race every game: “a jack of all trades is a master of none”. By narrowing down the possibilities of what can happen in a game, you reduce the amount of learning it takes to increase your skill level. In the time it takes you to answer the question “how should I play each of these 10 different builds against 2 rax expand?”, you could instead answer the question “how should I play my one build against 10 different builds that Terran can do?” When working on a single build at a time, you learn all the nuances of it. You know what to do vs standard play, cheesy play, etc. You know what your build is weak against, and figure out a way to scout it coming. You know exactly how to adjust your build in response to scouting, and thus eliminate its weaknesses. You have an idea of what to do at every stage of the game. But most importantly, you will know the build so well that you don’t have to think about it when playing. And it is at this point when mechanics start to improve: as you no longer have to make decisions on the fly, your mind is free to think about making workers constantly, keeping your minerals low, avoiding supply blocks, and watching the minimap. This is how you increase your APM without spamming. Unfortunately, the strategy forum in its current state is not conducive for this method of practicing. A quick search for [G] reveals that almost every Protoss build order guide is either outdated or gimmicky! In the Standard Play series, I am not attempting to create anything new here or get something named after myself; my goal is to give players an up-to-date, comprehensive gameplan that can be done in every game against every opponent. These are builds where you go in the game thinking “I can win if I execute well”, not “I can win if my opponent doesn’t scout this” or “I can win if my opponent has never seen this before”. You will not have to worry about whether you need to change your build completely when you lose, because there is no hard counter. Ever since day 9 of the Starcraft 2 beta, Protoss players have been complaining about the strength of the marauder. How was it possible that spamming a 125 mineral 50 gas unit, the Protoss player’s favorite strategy against Terran for 12 years, was now hard countered by some guys with grenade launchers? 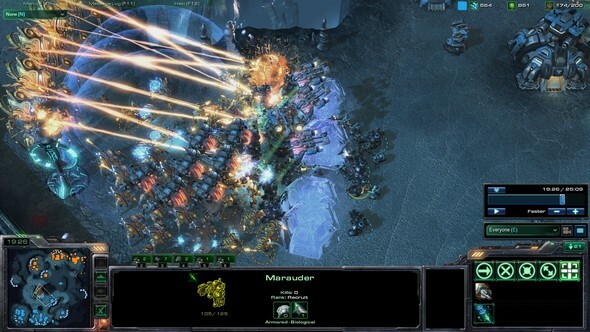 As players gained more experience with Starcraft 2, they quickly discovered the strength of a marine/marauder centered early game. Because barracks units benefited from three relatively cheap upgrades that could be gotten early on, a bio army would always be able to defeat a gateway army of equal value. 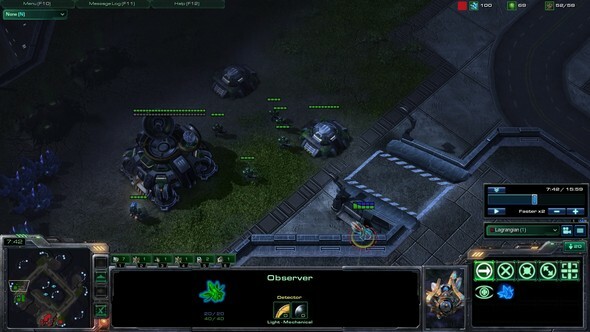 Terran players took advantage of this dominance of the barracks over the gateway to either finish the game early with a 3 barracks “I hope he misses his force field” rush, or take map control and expand first with the goal of eventually getting medivacs to further strengthen his army. The result? A ton of balance complaints by Protoss players. So what was Protoss to do in response? The answer had to be some form of AOE, as the bio ball melted through pure gateway units too quickly. It was around August-September when the Korean player NEXGenius began to gain recognition for his skill in PvT. By using good sentry micro to hold off early rushes, he was able to expand relatively early off of a 2 gate robo opening and then tech to colossus afterwards. Armed with a range 9 unit that does splash damage, the bio ball didn’t look so scary anymore. In a series of games against the likes of oGsEnsnare and MakaPrime, NEXGenius demonstrated that as long as the Terran player does not have a macro advantage, Protoss could not lose a straight up battle against the once feared bio ball. With the fall of the bio ball (and the introduction of the colossus + HT combination), the balance of the matchup shifted in Protoss’ favor. Then came qxc and SeleCT, who exploited the colossus-based army’s lack of mobility to defeat their Protoss opponents in IEM New York and MLG DC respectively. While marines and marauders could no longer stim and attack move through a colossus-based army, their mobility and efficiency in small groups made them excellent tools for harass. The medivac’s healing meant that a drop was almost always cost effective against freshly warped in units, and its speed allowed for a retreat before a larger army could come clean it up. While the Protoss army was busy defending against drops, Terran took advantage of their complete map control by attacking key locations with the main bio force. And so, Terran players with high APM enjoyed tremendous success in their TvP games by repeated drops to overwhelm their Protoss opponents’ multitasking ability. Eventually the Protoss player would crack under the pressure and leave an opening for marauders to come in and right click on a Nexus. The MM drop was no longer something you did occasionally when you saw an opening; it was something you did over and over to create openings. All of this pressure allowed Terran to expand with impunity and use their planetary fortresses to secure a huge economic lead. With the introduction of this high APM aggressive style, all of a sudden it seemed like Terran was Bisu and Protoss was Savior: spread too thin to defend against the constant harass. 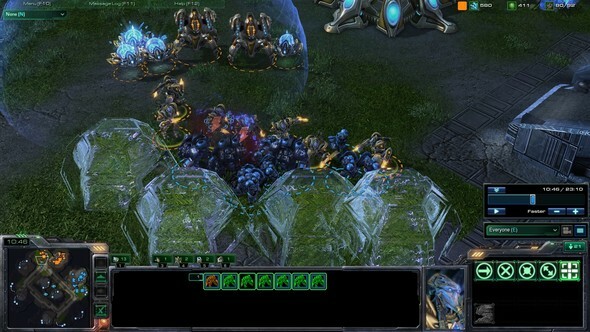 In order to adapt to this aggressive style of TvP, Protoss players had to modify their strategies a bit. The modern colossus push incorporates a faster blink and a delayed third base to defend against harassment. Note: Because PvT has a greater variety of strategies than PvZ, this thread will focus on the most standard macro game of gateway + colossus vs MMM + vikings. Deviations from this will be scouted by an observer before you commit to anything. The plan is to open up with 2 gate robo to secure a fast expansion with sentries. Colossus tech will follow very quickly, with upgrades coming soon after. You will mass up units until you have blink, at which point your army not only has the mobility to defend against drops, but also becomes immune to viking harass vs your colossi. The mobility of your army allows you to push out and set up proxy pylons, a third base, etc. From here you use the range of your colossi and maneuverability of your blink stalkers to pick off units and whittle down the Terran player’s army as you push across the map. On 6 gases, you will either add another robo for more colossi or tech to high Templars depending on the Terran’s unit composition. You can get to the midgame using any 2 gate robo build you like. My favorite one is Genius’ build from this thread due to its high sentry count. This is done in 3 steps, to determine whether your opponent is opening with MM or tech. 1. The scouting probe: what you’re mainly looking for here is the marine count. If the barracks adds a tech lab after a single marine pops, it’s a MM build. If the barracks continues to make marines instead, you can’t rule out MM but you should begin to suspect a tech build. If you see no gas, be wary of proxy barracks. 2. The stalker poke: Take your first stalker and attack with it. Skip this step if you saw 1 marine + tech lab, as not only do you already know what he’s doing, he can get concussive shell in time to kill this stalker AND you need to be home in case of a reaper. Risky on far positions for the same reasons. You’re looking for a bunker to confirm a tech build, or a marauder without concussive shell if they went for multiple marines to hide their tech lab from your first probe. It’s fine to skip this step if you feel like it’s too risky, as your observer is so early. See that bunker? It's clearly not a marauder opening, so go ahead and take the 36 Nexus. 3. The observer: This reveals exactly what build you’re up against. Now that I’ve told you how to scout, there are some adjustments you can make based on what you see. I didn’t make build order adjustments as clear in the PvZ thread so this should give you a better idea of how to adjust your build to scouting. 36 Nexus: you usually won’t be able to get this against a good Terran if he opened MM, so just wait for your immortal and more zealots/stalkers. Against delayed marauder pressure (which is very rare because people usually attack with their first 2 marauders), you can just cancel. If you get pressured heavily and can’t expand even after the first immortal is out, you might as well spend the built up minerals on a 3rd gate. You can usually get a nexus on 44 supply vs 2 rax. and chrono boost an immortal. If you're on close positions, you can make a zealot while the core is building to avoid having to pull a few probes against this. Scouting probe makes you suspicious of proxy barracks: You probably don’t want to go robo before 2nd gate here, right? 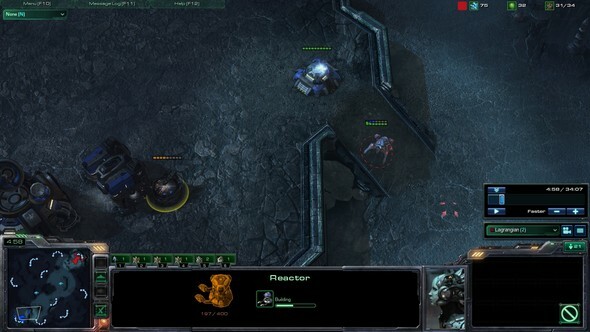 Scout the popular proxy locations and leave your probe or stalker outside his base to check for the mass SCV pull. @100% Robotics Facility: if you knew from step 1 or 2 of scouting that you’re up against a MM build, you can go immortal before observer to get your expo up a bit faster against MM pressure. If you have a stalker at a watch tower and you see there’s no pressure coming despite a MM opening, then your opponent is bad and you might as well take the 36 nexus before immortal. 2 Sentries after Warpgates are done: if you saw a bunker and know it’s a tech build, you may want to think about think before you warp. This 1 stalker 4 sentry opening is fine vs MM and banshee builds, but if his tech build turned out to be a tank rush, then you’re really wishing you made mineral units instead of sentries here. Observer sees starport producing without a tech lab: it’s a fast drop. Check for a tech lab on the factory to determine what kind of drop it is. If it’s blue flame hellions, get ready to play the best Starcraft of your life because that’s what it’ll take to win. 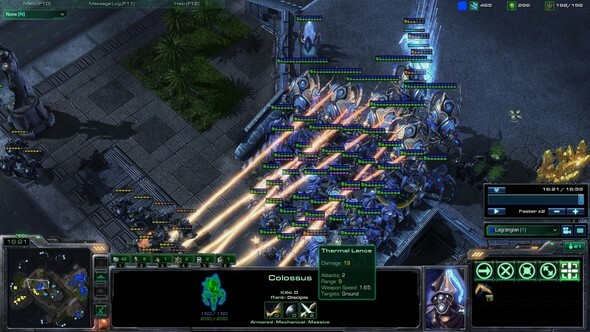 Observer sees Synystyr’s Anti Colossus Build: take a guess as to whether you should follow the rest of this build. Observer sees mech: I don’t face this enough to know what to do, but I heard you can use any unit composition you want vs this. Check out naniwa vs goody on LT for this. Observer sees MM and expansion: this means you’re playing the standard macro game that the rest of this thread is covering, so move on to the next section. So your Nexus is warping in and your observer just saw an expansion protected by bunkers. I tend to delay the range upgrade for a bit because if the Terran player attacks early, I don’t like the idea of paying 200/200 for an upgrade that affects 1 unit in my army. From here the build can diverge in a few different ways. This is a more aggressive timing attack you can go for if you see anything that suggests late vikings, or if you’re on close positions/small maps. Or you can use it defensively against a 6 barracks all-in. You add a 4th gateway and push out when you have 3 colossi to set up a proxy pylon close to their base. Once you have 4 colossi, begin poking at their natural expo, possibly adding a 5th and 6th gateway back at home for reinforcements. You can stop at 44 probes if you want to get aggressive as soon as possible, or 52 probes if you want to get most aggressive at 5 colossi and 6 gates, or 60 probes if you just want to use this to pressure and transition into late game. This version is somewhat all-in, as it skips the twilight council and blink in order to push before the Terran can get a lot of vikings. If it doesn’t do significant damage, your lack of a twilight council means you will have a very difficult time getting to the late game. As such, it's less effective on farther positions. Twilight council, blink, +2 weapons: This is the safest way to play the PvT mid game, so I will call this standard play. 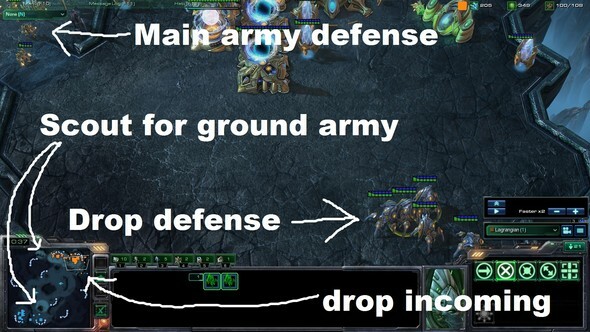 As mentioned in the history section earlier, the Protoss army’s lack of mobility is exposed by drop harass. Without increasing your mobility in some way, it will be impossible to defend three bases against aggressive harassment. Blink not only gives you the mobility needed to take a third base, it has the added bonus of restricting viking movement: if vikings want to hit your colossi, they can no longer do so without bringing the rest of the bio ball with them. It only takes a single good blink against viking harass vs your colossi, drop harass vs your buildings/probes, or retreating units after a battle for the research to pay for itself. Charge is a very good upgrade as well, but its purpose is to deal with kiting, which isn’t really a problem until later in the game when HTs replace sentries as your gas unit. As mobility is so important against any kind of harassment, be it mutas or MM drops, I feel that getting blink early is the best way to play a colossus-based midgame. Meanwhile you are using producing constant chrono-boosted colossi and warping in stalkers/zealots/sentries. Going for the faster nexus is a lot like the “36 Nexus” step in the early game: sure you can’t actually defend it yet, but what if he doesn’t attack? You can just cancel the nexus if it does get attacked or get a free expansion if it doesn’t. By the time you can’t cancel anymore, it won’t matter as blink will be done. Making a 5th and 6th gateway instead gives you a stronger 2 base push, so I prefer it on maps or positions where it’s hard to take a third base. +1 Armor is cheaper than +2 Weapons and gives you the option to go double forge later. +2 Weapons gives you a stronger timing attack. The completion of blink gives you mobility, so use that as your cue to move out. By taking map control, you move any points of engagement to the Terran’s side of the map so your third should be safe. From here, refer to Engagement Tactics. Benchmark: if no major battles have happened yet, around 16 minutes you should be very close to maxed, have +2 Weapons, and have a third base. you take a small risk to set up an even stronger 3 base push than you would have with the standard build. Make sure you check for the 6 barracks no factory all-in with your observer before you do this. This is my build of choice nowadays and could become the standard one day, as it’s almost unstoppable if you don’t die to a timing attack. If you have a favorable engagement early on like in game 2 of ZeeRax vs Strelok, I believe you should play this version every time as there's no longer the risk of a timing attack. Even if you don't take an early lead, game 3 of ZeeRax vs blur shows that if you go double forge, all you have to do is barely survive the attack and you win. Warning: this version is not for those with weak mechanics! Yes, you will have to hit perfect force fields, never go above 500 minerals, and play scrappy if you want to survive a big attack that hits when you’re vulnerable. But if you do survive or don’t get attacked, then the rest of the game is pretty much easy mode. The main tactic you need to worry about is where the Terran drops your main, pulls all of your units there, and then kills your expansion with his real army. To deal with this before blink, you’ll have to split your units. Keep a group of stalkers in your main near a likely drop path and put everything else by your expansion. Meanwhile, use a probe and an observer to scout for an attack from the Terran’s ground army. At your expansion, keep your zealots and immortal in front if you have one while everything else stays back. This is pretty much your defensive position, though I would've liked to have either another probe checking the watch tower or better observer positioning to see his main army. You don’t need that many stalkers in your main since you want to focus down the medivacs as soon as they appear on your mini map. In the case that they do get multiple medivacs in and drop more units than your stalkers can handle, pull 1 or 2 colossi to help out. Stalkers should focus down medivacs while freshly warped in zealots tank damage for the colossi. 1. Before the battle starts, position all of your zealots at the front and make a guardian shield. 2. Use force fields to cut the army in half and trap the closer half next to your zealots. This is different from engaging an army in PvZ because you have more zealots against Terran and their units are much more fragile than roaches. As a result, you want to keep them close so that they are subjected to your zealots’ awesome DPS. 3. Blink under vikings if if mid or late game. 4. If you still have energy, make another line of force fields behind the other half. 5. Blink when they retreat if mid or late game. If you find yourself very stalker-heavy, then use PvZ engagement tactics instead while you build your zealot count back up. Pushing: your goal is to micro your colossi and blink to outmaneuver the Terran army. For the most part, this means poking at the army with colossi to get free hits and pulling back when vikings come. If the vikings follow, drag them into a spot where you can blink in your stalkers. As you may expect, the micro can be pretty difficult if you want to maximize the effectiveness of your units. You can get away with a 2 hotkey setup if you want to keep the same mechanics between PvT and PvZ, but having a third hotkey will let you do more with your stalkers, and I do occasionally pull off micro that can only be done with a 3 hotkey setup. There's also another 2 hotkey setup where you put stalkers in 1 group and everything else in another group, which makes it slightly more difficult to micro colossi but gives you another hotkey for an observer/warp prism/HTs. This setup and the 3 hotkey setup give you the best defensive positioning and stalker utility. Pick whichever setup suits you the best given the pros and cons. -See double starport? Make a Templar Archives. -See double starport but you’ve killed a ton of vikings already? You can go Templar Archives here as well, but making another Robotics Facility is also an option. -See ghosts or only a single Starport? I’d add a 2nd Robotics Facility. -Did you go single Forge + Twilight Council and get 1/1 upgrades? Now is the time to add another Forge. -Have a ton of gas to burn but you see ghosts already? Might as well make a Dark Shrine. Any time there are ghosts, add an observer to one of your main army hotkeys. By the time you’re on 4 bases, there’s no reason not to have a Templar Archives and a 2nd Robotics Facility regardless of what you chose to add on 3 bases, regardless of how many ghosts/vikings you see, etc. I also don’t see any reason not to have a Dark Shrine, as 250 gas is nothing at that point. In fact, even add some cannons and extra gates just to handle drops. Once you have a strong economy supporting the production of colossi and Khaydarin Amulet Templars, you are more or less invincible against bio if you have storms, so add an observer to your army just in case of EMP. Just keep pushing and expanding, and the game should be pretty straight forward from there. Is a Terran player QQing about balance? This is probably what he's thinking about. And there you go, a complete gameplan for standard PvT! Watch this game. It's epic. I misread his main army's position due to bad scouting and relaxed on the defensive positioning, which resulted in him killing my natural expansion to gain a huge lead. Normally that kind of mistake should be game ending against a player of this caliber, right? I thought so too, but what happened next could only be explained by the power of double forge. Watch as my well-upgraded units win battle after battle and slowly get me back into the game! Not the closest game out there, but this is the best replay to show the utility of the 3 hotkey setup. Look how many free kills I was able to get just from planning out my hotkeys well. Old replay showing the 4 colossus 4 gate +1 timing. Finally got a game vs a famous player! I went for the standard build here since double forge doesn't make sense on close positions, and I got supply blocked too many times to do the 4 colossus/4 gate/+1 timing. This build order should be obsolete within a couple weeks. Terran's are learning time and time again that Bio past the 10 minute mark is a waste. I think the new hotness for Protoss will be Starport openings. Hell, its awesome to LOSE to nukes! - Khaydarin Amulet upgrade (+25 starting energy) has been removed. So suddenly Terran has forgotten all about tanks??? Closely followed would be a robo bay, forge and twilight in that order once I put down my nexus. My next aim is to have +1 weapons when my range is done. This is good stuff. You seem pretty knowledgeable, what do you think of getting charge and stargate units instead of blink? i like it a lot and it seems that it would be even better if the HT Nerf went through. If it’s blue flame hellions, get ready to play the best Starcraft of your life because that’s what it’ll take to win. I've seen players have success going charge and phoenixes but I think non-stargate play is a little more standard, and I don't have enough experience with it. I only use it against 2 port banshee openings where they don't all-in because I already have the stargate. If you want to play that style, I would suggest this thread where incontrol goes through a build to use that instead. Wow one of the best threads lately! Will read when I have time. Absolutely awesome thread! I'm going to absorb every little detail from it as soon as I can! very nice post, most of which goes through my head in game. cool to see it written down and analyzed! no pvp standard play =/. Awesome guide will definetely use this in combination with the 1gate FE, I send first scout cross position, if he's there 1gate FE if he's not 2gate robo <3 Thanks a lot man. By the way, how do you feel about 1gate Fast expand? I think its really viable especially with long rush distances.